Durham School students, including AGC student members, tour the HDR headquarters under construction in Aksarben Village in Omaha. 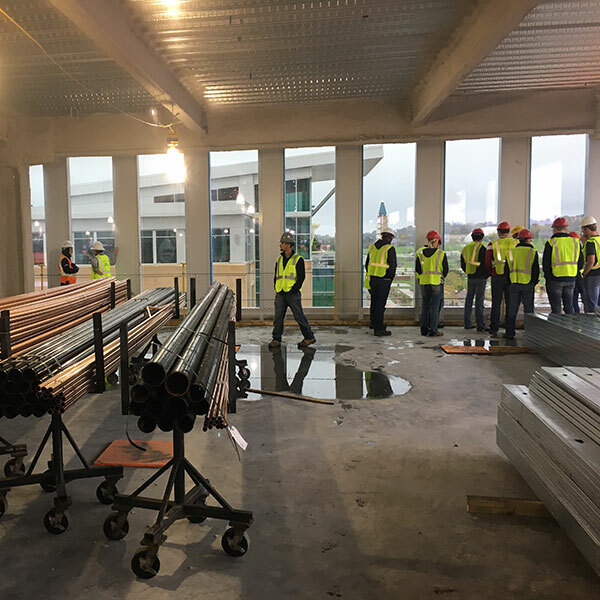 Durham School Construction Engineering and Construction Management students recently toured the HDR headquarters under construction at Aksarben Village in Omaha. Tour hosts included members of the Kiewit project team. Students were given a behind-the-scenes tour of the sixth floor to view site prep, as well as observe the footings being poured for the parking garage. Kiewit's Josh Render and Shaun Jones (CM 2012) provided a wealth of information to students on topics ranging from site utilization to cash flow management on a $110 million, 10-story urban infill project. Of particular interest was the sequencing of construction activities to enclose the building so that work may progress through the winter months. Key to this was the prefabricated curtain wall system that allows an accelerated construction schedule while reducing manpower and site support logistics. Tour groups included Associated General Contractor (AGC) students, as well as students from the Introduction to Construction class. Students also met directly with Kiewit project leaders where they learned about project delivery methods, site preparation, tower crane mobilization, fall protection, the processes for pouring concrete floors, and the urgency to enclose a construction site before winter to allow for temporary heating. Important safety measures also were outlined for protecting employees and workers on the ground and up high as the building construction ascends. "Our students get such unbelievable opportunities for hand-on learning thanks for our industry partners," said Kelli Herstein, lecturer for Introduction to Construction at The Durham School. "Their continued, unwavering support truly sets apart our programs and provides leadership and guidance to these future generations."